We go to great lengths to find fabulous small companies producing high quality, delicious products that we just know you’re going to love. All our suppliers are small, independent and ethical companies, just the sort of businesses that we want to help flourish. The following is just a taster of what we sell, pop into the shop to see our full range. Looking for an amazing marinade for your chicken, a delicious cooking sauce for your beef, some chutney for your ham roll, or just some good quality oils for cooking and drizzling? Look no further. We have a wide range of sauces, marinades, oils and gravies for you to use in your recipes. Suppliers we stock include Stoke Sauces, Isle of Arran Chutneys, Summer Harvest Rapeseed Oil and Potts Sauces. We also have a range of flavoured oils and truffle oils. We stock a selection of beautiful honey from the hives of Chain Bridge Honey Farm. We are proud to support this family farm in the Scottish Borders, which has been producing honey for 80 years. 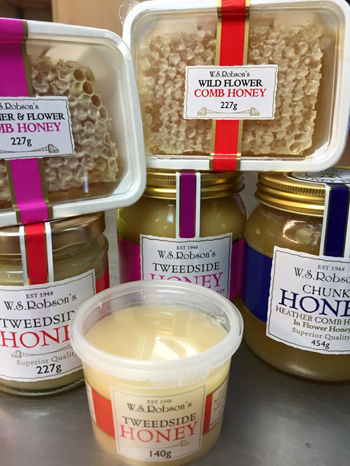 We also stock local supplier, Webster Honey. We have flower honey, clover honey, heather honey, and divine comb honey, so treat yourself to a little bit of honey heaven – perfect on Hunter’s bread rolls, which are baked on the premises! Macaroons from Crieff, tablet from A Sweet Treat in Kinross, Walkers shortbread, Nevis cakes and Borders biscuits are all available in the shop. Perfect with a cup of tea, what’s not to love! We also bake fruit pies and crumbles in the shop. Crumbly pastry, sweet fruit - just pour over some cream and you have the perfect pudding. Need some tasty vegetables to have with your dinner? Not keen on eating produce that has travelled half way round the world in cold storage before it reaches your plate? Hunter’s has fresh, seasonal vegetables delivered to the shop 3 times a week from local farms. When possible we have ‘dirty’ carrots from Channel Farm, turnips and onions from Tayside and a variety of potatoes. We often have sweet potatoes, garlic, celery and salad. We stock fresh tomatoes from Carluke, and other produce in season: asparagus in the spring, rhubarb and local strawberries in the summer. 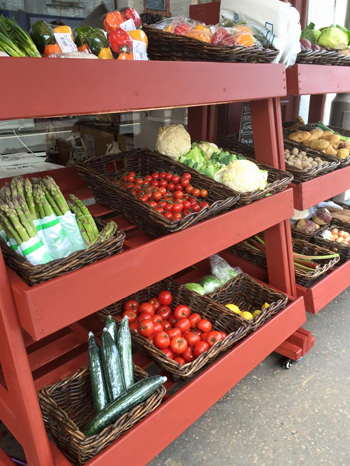 Our greengrocers stall outside the shop displays all our produce, so stop by and have a look at what we have on offer today. Bored of the same old soft drinks? We stock the full range of San Pellegrino along with drinks from Fentimans and Cawston Press amongst others. As with the rest of the pantry, we are always looking for new and interesting brands to add to our range, so you never know what you might discover. We also stock milk from Grahams Dairy, a family run dairy in Bridge of Allan. As with our meat, we are passionate about supporting the farming community and keeping family businesses operating. You will also find cheese, yoghurt and cream to add to those delicious dishes you’ll be cooking up! As well as our freshly baked pies and pastries, we always have a selection of pies in the freezer, along with a range of meats including game birds, rabbit, hare and duck. We are happy to put together freezer packs with whatever items you would like, and we give a discount based on order value.